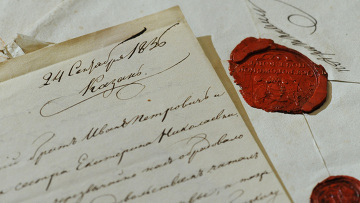 The unique handwritten Constitution of the Russian Federation, sacral mantra from Germany, unique exhibit from Asia, “calligraphy on a fly’s wing” and other calligraphy artworks from thirty countries will be demonstrated at the International Exhibition of Calligraphy in Moscow from October 15 till November 14, informed RIA Novosti the press service of the Contemporary Museum of Calligraphy. As the press service puts it, the exposition will be located in pavilions 7, 7a and 17 and will demonstrate the artworks by the renowned artists from Russia, Ukraine, Israel, Italy, France, Germany, USA, Japan, China, Iran, Brazil, Belarus and other countries. For the first time ever the exhibition displays a masterpiece of sacral calligraphy placed on the Guinness World Records, a sacral Jewish manuscript written in parchment by a renowned Jerusalem calligrapher Abraham Hersh-Borshevsky. Besides, the visitors will see a draft illustrated handwritten anthem of the Russian Federation (a present to Dmitry Medvedev from Silvio Berlusconi)? Calligraphic carpets from Tunis and many other works. The opening ceremony will welcome the most illustrious calligraphers of the time. Among them are Barbara Calzolari, calligrapher of Pope Benedict XVI, Massimo Polello, the President of Turin Calligraphers Guild, Nja Mahdaoui, artist of UNESCO and Arabic sheikhs and other masters.